Created and written by 30 Rock writer Tracey Wigfield, NBC's Great News is anything but "new" in its comedic format, but that's not always a bad thing. Ten episodes were provided prior to broadcast. 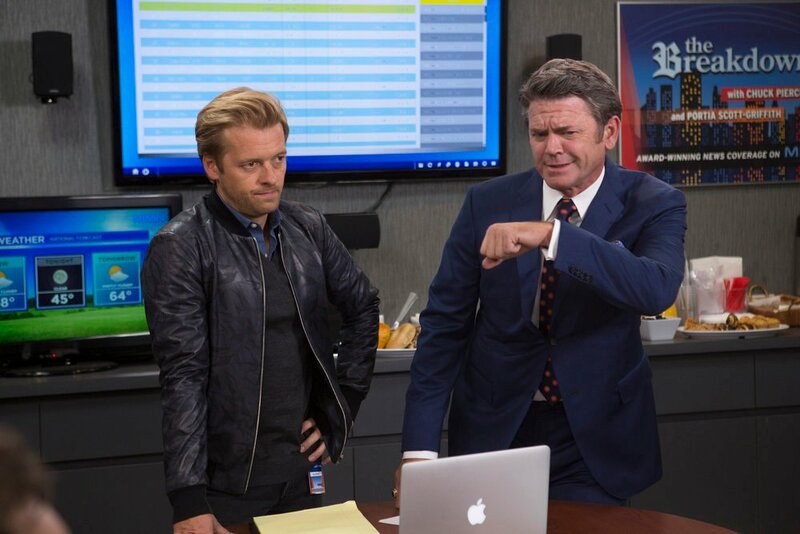 Created and written by 30 Rock writer Tracey Wigfield, NBC’s Great News is anything but “new” in its comedic format, but that’s not always a bad thing. In fact, that’s probably what the network was banking on. It should be stated up front that Great News is weirdly unbalanced in its first few episodes (emphasis on weirdly), taking at least five instalments to settle into a worthwhile rhythm that lives up to the pedigree of its showrunners, and that’s a lofty standard. It will be quickly obvious to 30 Rock and Unbreakable Kimmy Schmidt fans that Tina Fey co-executive produced the show, lending it that same alternate reality of “bing” sounds and accompanying rapid-fire jokes that feel like rejected flash cards from a writer’s meeting for any one of the aforementioned shows by the same producers. 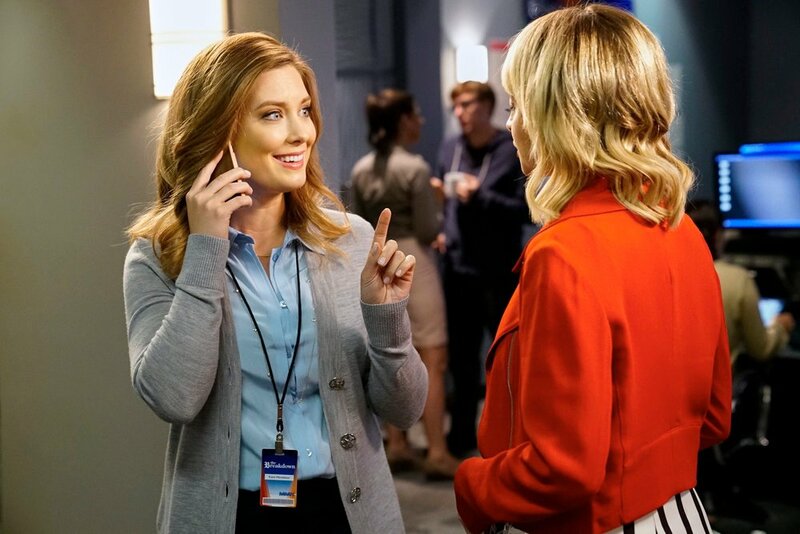 Great News stars Briga Heelan as Katie Wendelson (Love), a young, but rising TV news producer who now has to contend with her newest intern: her mother Carol, played by SCTV‘s Andrea Martin, a comedy veteran and legend. If you haven’t already guessed that this gag will be overplayed for jokes about parental boundaries in the workplace, then you might find the Great News pilot to be exceptional comedy. In general, absurdist fantasy comedy reaches its full effect when handling characters with enough layers to make the audience genuinely curious about what the script will do next with who. But as Great News unfolds, its one-note characters are as predictable as half of the jokes at times, though the workplace sitcom does eventually figure out which of its ensemble works best with who after what must have been some extensive trial and error. It also doesn’t help that instead of some much-needed character development in the pilot comes a competition of average one-liners in place of winking at the camera with both eyes closed. That said, character development was doubtfully a priority. When quick jabs aren’t being tossed at an unsuspecting audience, a quasi-relevant diatribe about millennials and the media will get thrown about, as if to satisfy a bullet list of social commentary demands from the producers without thinking through what would be fresh and engaging for these familiar, archetypal characters. Fortunately, the pilot gets most of these easy targets out of the way by episode 2, which allows room for genuine chemistry between Carol and Chuck, played by John Michael Higgins, the news network’s star anchor. In most episodes, the show plays around with the clashing of generations and how ageism affects communication (and of course, the news media). A mother and her daughter are caught up in the similarly disparate worlds of TV news and career aspirations according to the era they grew up in, but it’s often hard to believe the persnickety characterization of the older stars considering their encyclopedic knowledge of the various terms and pop culture references they claim to reject and misunderstand. It’s the clumsy result of a clumsier script, unfortunately. Looking at Great News as a whole, however, it’s unfair to give the entire season a thumbs down. Once the show discovers what it really has in its holster (a biting rivalry between Chuck and Nicole Richie’s Portia, for example), it finds its comedic stride with some truly inspired writing. Sadly, though, it never quite rises up to the levels of original insanity it learned from its predecessors or manages to surpasses them. Mostly because the comedy itself is a step ahead of the characters. That ladders up to a question I still have about Great News 10 episodes later. Who is this show for, really? Part of me wants to believe it’s a creative expression from someone who is both sympathetic with older generations but also hopeful for the future in the one that lies at its feet. This becomes obvious as Wigfield develops Great News into a comedy with a more defined storyline across multiple episodes. By the end, I mostly just appreciated it though for the handful of hilarious, albeit somewhat forgettable, moments it provided in its quick pace, enough to make the entire offering a commendable experience. Otherwise, I’m forced to believe by its midseason schedule and rapid fire release that NBC made this show on a whim, not because they truly believe in its viability. That’s definitely a shame.